This is a very pretty and tasty vegetable side dish from Food & Wine. I chose this particular recipe for several reasons, one, it's an easy vegetable recipe, and two, because it didn't contain any cheese. I wanted the flavor of the fresh vegetables and herbs to stand out yet not compete with other flavors in the dinner. It was the perfect accompaniment to a simple yet delicious meal of marinated flat iron steaks cooked on the grill with home made Henry Bain sauce and baked russet potatoes. Please read my "Cooks Tip's" following the recipe. Meanwhile, in a small bowl, stir the olive oil with the garlic. Coat a 9-by-13-inch baking dish with 1 1/2 teaspoons of the garlic-infused oil. Tear the bread into 2-inch pieces and line the bottom of the baking dish with bread, fitting the pieces tightly together. Drizzle the bread with 2 tablespoons of the garlic oil and season with salt and pepper. Sprinkle the bread with half of the basil. In a medium bowl, toss the eggplant and zucchini with 2 tablespoons of the garlic oil and season with salt and pepper. Sprinkle the tomato slices with salt and pepper. 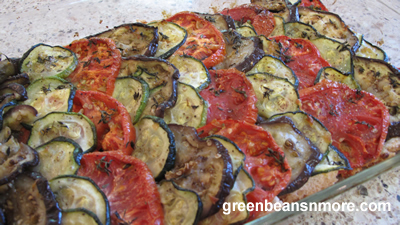 Arrange the eggplant, zucchini and tomatoes over the bread, overlapping them if necessary. Sprinkle with the thyme leaves, salt and pepper and drizzle with the remaining garlic oil. The gratin can be baked up to 2 hours in advance. Reheat in a 350° oven or serve at room temperature. Cooks Tip's: This is a simple recipe that requires you use the BEST ingredients. This is the time to use your BEST extra virgin olive oil, the fruitier the better. I made the oil/garlic mixture earlier in the day and let it sit. I suggest you thoroughly mash the garlic. Make sure you follow the instructions and salt and pepper as called for. You need more salt and pepper than you think. The bread browned before the vegetables browned to my liking. A few minutes under the broiler - WATCH IT CAREFULLY - will help to brown the vegetables. I served this dish room temperature, it was delicious, and letting it sit allowed the vegetables to release more of their flavor into the bread.